The first partnership was arranged with Vitry-sur-Seine in France already in 1964. The manufacturing of porcelain and since 1979 also a partnership associates Arita-cho in Japan with Meissen. The traditionell winegrowing in Fellbach / Baden-Württemberg and in Meissen caused the partnership of both towns in 1987. 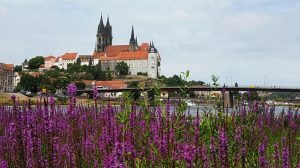 The connections to the Greek Korfu, world cultural heritage of UNESCO, and to the north Bohemian town Litoměřice in the Czech Republic, the historic town on the Elbe river with traditionell winegrowing, exist since 1996.